Garage doors, like everything, can become faulty after a while, springs can break, and cables can tangle. Here at SDM Doors we like to boast an unrivalled wealth of product knowledge and provide a Garage Door repair service that is second to none. 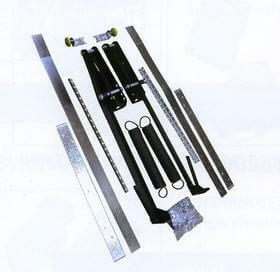 Our installers carry a wide range of spares, as we aim to repair your garage door on our very first visit. Like every garage door repair company we do have a call out charge but this is very competitive and is only charged once, even if on the rare occasion we have to order parts and make a return visit. We don`t believe in trying to push you to buy a new garage door, when an existing unit can be repaired. This is why with our garage door repairs service we do our up most to obtain parts, even if they are obsolete. Garage doors should be serviced annually, with regular lubrication of moving parts on the door such as roller spindles and link arms. If your garage door is in need of a service and an overhaul from one of our experts then give us a call, we will be happy to help.